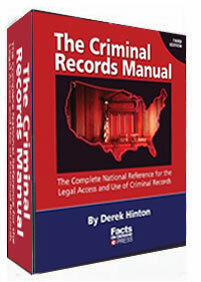 The Complete Guide to the Legal Use of Criminal Records And Obtaining Access In All 50 States! Includes Various Methods To Access Criminal Records, Tools And Resources To Access Them With As Well As Various Legal Issues And Restrictions That Deal With Accessing And Reporting Them. If Your Investigative Practice Involves The Use Of Accessing And Reporting Criminal Records To Your Clients, Then This New Manual Is Essential To You And Your Investigative Practice! Criminal records are the number one records request for private investigations and screening processing. Knowing how to access them and the various federal and state laws that apply to their access and reporting is essential in the practice of private investigation. This manual makes you a walking expert on accessing and using criminal records in your private investigations and is MUST HAVE material for any investigator in practice. The Criminal Records Manual is a comprehensive compendium clarifying the access and legal use of all U.S. criminal records. Includes citations and explanations of all state statutes involving criminal record use by employers and employment screening firms. Extensive attention to compliance with FCRA and other Federal Regulations. Extensive profiles of state agencies, statewide court databases and sexual offender record access. A must for all employment screening firms. Statewide court structure begins at the county, How courts maintain records- court computerization- searching state courts online- court records search tips. The state central repository- non-uniformity of state systems- State statutory provisions for access to FBI records-State interstate dissemination policies. Federal criminal records and the U.S. District Courts- How U.S. district courts maintain records- recent restrictions imposes to electronically accessed criminal documents- Other federal criminal records trends- The FBI NCIC database- national crime prevention and privacy compact- Access to NCIC for non-criminal justice purposes- When non-criminal justice agencies are granted access to FBI records-the fingerprint dilemma. Incarceration records- parole records - probation records- state sexual offender records- federal fugitives peso- military criminal records. Know thy repositories- State versus county searching- Myth of public records and the internet- Using the freedom Of Information Act and other acts. Advent of the criminal records vendor- Types of vendors and services offered- Benefits of service vendors - Ancillary tools that criminal records vendor provide - Where to find a vendor - How to choose the best vendor for you. Identification issues - Asking for the date of birth - Importance of proper documentation - Sample criminal records release form - Pros and cons of using misdemeanor records. FCRA and employers - overview of the FCRA Act - Sword and the shield - Primary effects of the FCRA on employers using a vendor to obtain criminal records - FCRA restrictions on reporting arrest information - Using aged public records for employment purposes. What do federal and state Interrelations have to do with ordering criminal records? When in conflict - Which law federal or state - pre-empt's the other? - Summary of FCRA and state law interrelations - Good news for users. Criminal records and bias employment practices- What are the EEOC's Guidelines - four important EEOC notices. States that prohibit the use of arrest records (i.e. non-conviction records) - States that prohibit the use of misdemeanor convictions - States that prohibit the use of expunged or sealed records - States that limit the use of first offense records - State that restrict the use of arrest records based on time periods - States that limit record access to employers within certain industries - Legal concerns versus gut reactions- If you get into trouble. Detail pages for each state including access requirements, restrictions, fees, online modes of access, policies and procedures, analysis of county courts for each state, statewide court systems, profiles for obtaining records from state prisons, state sexual offender registries and how to access them. How to access federal records by mail and phone. Online access to records- PACER access- US party/case index - CM/ECF-case management/electronic location of the U.S. District Courts. About The Author: Derek Hinton has over 20 years experience in the field of employment screening and motor carrier safety issues. Mr. Hinton has been instrumental in developing and managing many employment screening services and products for several firms. He is a frequent expert witness and contributor to publications on the topics of negligent hiring, the Fair Credit Reporting Act and the Americans with Disabilities Act and has been a featured speaker to many groups including the American Trucking Associations and American Bar Association on such topics. Personal Note From Ralph Thomas: Aside from the highly important legal issues and restrictions you need to understand to stay out of trouble when it comes to using criminal records, this massive manual teaches you that there are more than one way to access various types of criminal records you need to know about to achieve success in private investigative practice. It is often said that a private investigator is only as good as the information he or she obtains and the use of criminal records is the number one type of record that almost any private investigation will make use of. If you use criminal records as part of your investigative process, then it is essential that you arm yourself with the expert knowledge, tools, legal issues and various forms of access availability found in this manual. It's decision time and we highly recommend that you make the small investment in The Criminal Records Manual so you too can obtain a knowledge-base of extensive expertise when it comes to accessing and using criminal records. Do it right now before you move on to something else. I know you will be glad that you did and guarantee that you will love this manual.